Apostrophe Catastrophes: Why Do You <3 Bad Punctuation? I think he also needs to go on English Language fail, because I'm guessing it means "highfalutin sophisticated swine" -- i.e. people who know where to put their apostrophes and each arugula. Is it possible to go to hell for being stupid? If so, the maker of this horribly offensive sign should watch out. I think I need to burn my eyeballs out after reading that mess. Apparently druggies, government recipients (hard to see if the apostrophe is there)and effeminate men deserve/merit correct spelling and punctuation, however. 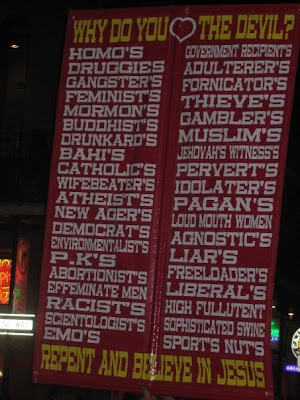 My personal favorite is "Sport's Nut's". This sign is just awful! Wow. I'm sure the Druggies are very happy that they are safe from this catastrophe. We'll agree with him/her on the racists, emos and sports nuts, but highfalutin sophisticated swine? We take umbrage! No Jews? COME ON! That's such a basic one. I'm offended at being left off his list. Hate me too, damnit! One of the only moments I was proud of my school was when Westboro Baptist Church sent us an angry letter. Their grammar was fine, by the way. Bahi's -- If we're talking about a religion that originated in Persia, I think there's also a spelling catastrophe going on here. Teky, wow, good point! I am surprised at that omission, too! I'm struggling to see which section of the poulation this person is aiming for. By excluding racists he really has shot himself in the foot as the majority of people irrationally fearful of the other categories would likely be racist too. A very niche category of lunatic. Jesus was a gangster, a feminist new ager, and an emo, liberal, high fullutent, sophisticated freeloader. He should repent and believe in himself. everyone on the list should get together for one helluva party! Are sport's nut's like beer nut's? This sign's making me sick to my stomach.